For my first Halloween tutorial of the year I have created a pink fairy makeup look complete with wings, a wand and flower crown. 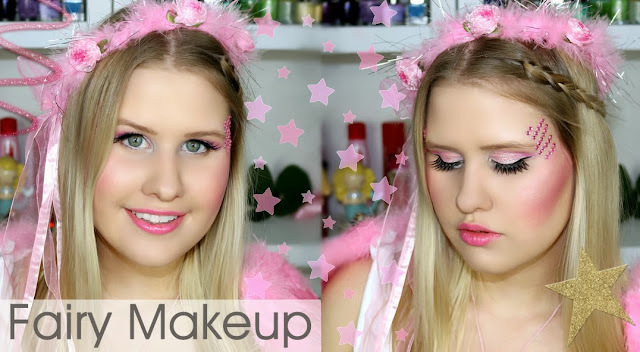 This tutorial consists of glittery pink eyes, fluttery wing lashes, a structured blush look, rhinestone details and finished off with a glossy light pink lip. A cute and girly costume idea for Halloween, lots of pink and lots of glitter were harmed in the making of this tutorial! Click HERE to see the video tutorial. So as you can probably tell, most of the products used are extremely affordable items, meaning that you can create this look on a budget. The costume accessories were found at my local discount store; wings ($6), halo ($4) and wand ($3). Don't forget to check out the video tutorial by clicking HERE. * Some products were gifted to me but this is not sponsored.